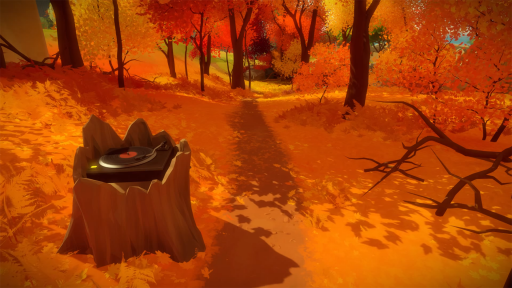 Once in a while I get a question, from someone who really liked the music in Braid, what the soundtrack in The Witness is like. The answer to this question is that there isn't one. There is (almost) no music in the game. This is not an arbitrary decision, but is in fact very important to the coherence of the thing we are making. The Witness is a game about being perceptive: noticing subtleties in the puzzles you find, noticing details in the world around you. If we slather on a layer of music that is just arbitrarily playing, and not really coming from the world, then we're adding a layer of stuff that works against the game. It'd be like a layer of insulation that you have to hear through in order to be more present in the world. Instead, we put a great deal of care into the sounds of the world around you, in a way that maximizes immersion in the game. This is made trickier by the game's setting: you are alone on this island, and there are not even any other animals. There are no birds in the trees! In everyday life if we imagine the sound of nature, we'll think of some elements that have no place on the island: a forest naturally has the sounds of birds, plains with smaller shrubbery will have crickets, a marsh will have the sounds of many insects. There's none of that in this game because in this game you are really alone, and it has forced us to be very creative with the audio in order to ensure things have depth and texture to them. This work is being done by Wabi Sabi Sound, who did the sound for the very atmospheric Dead Space series, and more recently some smaller, artier games like Ori and the Blind Forest. Lately I have been doing a lot of work on story and voice acting stuff. When wandering around the island, you may find voice recordings that were placed by ... well, at the outset of the game, you don't know who; and as the game goes along, there is an interesting mystery to unfold about who these people are or were. In the game currently we have what is known as "temp voice", which is me reading all the parts under very noisy conditions and just getting them into the game so we can make sure the data works properly with the engine, to get all the subtitles into the game and roughly synced with the audio (which we need to do sooner than later so we can give the translators those subtitles, which they will translate into many different languages). We have cast the real actors and starting tomorrow we'll do our first test readings with those actors. We'll use this to get a new layer of temp voice in the game, which will get it closer to final; this will allow me to see how the game really feels with this stuff in there, possibly to adjust the nuances of the way the recordings appear in the game and the way they are played back. When everything feels good we'll do a set of final recording sessions. There's not a whole lot of time until release, and we have several holidays coming up, but we'll get it done! We are working with Warner Brothers Game Audio in Burbank, California to do the voice stuff; they are providing the facilities and voice direction and production assistance. After we do a few recording sessions I will have more details to share in this department. Earlier, I mentioned subtitles. As many games do, we will be localizing our game so that people who speak many different languages will be able to understand the words. We are not recording voice acting in different languages, mainly because it is pretty hard to make sure quality is high when you do that. It is hard enough making sure acting is good in just *one* language. We generally seem to feel the same way about movies: a foreign-language dub of a movie is generally considered to be inferior to a subtitled version, because the acting is so important. Our localization efforts will involve menu text and subtitles, just as for a good movie. We may add more languages later but man this stuff is expensive, so there is a limit to how many languages we can do at once. We will have more news for you before too long! Interested to hear how the role of voice narration has changed in the game. I recall you saying in a recent podcast interview that you were thinking of removing part of the audio diaries because of a feeling of conflict with the game’s aesthetic. Is that something you can talk about? I think we’ll go into more detail about that a little later when we can say more in concrete terms of what we *are* doing. But yeah, I did change the direction of the audio as mentioned in that interview, and I am very happy with the final form of it. I’ll be interested to find out why the recordings are there. No doubt there’s a very good reason. But I’ve always found audio diaries to be a lazy way to shoehorn story into games. The recordings have no reason to be there in the first place, and the story they communicate could almost always be done with better environmental storytelling. I hope this is the exception! As a fan of ambient, surreal scores like Robyn Miller’s score to Riven, I can’t deny I am disappointed at the lack of score. I found your explanation interesting because it’s very similar to the Miller brother’s initial feelings about scoring Myst. But then they tried it, and I cannot imagine the Myst games without their scores. Or how plants are pollinated without insects! Excited to hear this, thanks for being transparent about these aspects of your development. As a developer in training, it really gives a lot of perspective and informs how I’ll take in the game when we finally get to play it. Good stuff. Its a great to have an Arabic language, hope the translation is ready at launch. I recently watched an interesting video about implementing sound for VR. I guess the sounds in the Witness aren´t combined with objects in the game. So that there is real 3D-Sound like suggested in the video above, or is it? I really don´t know how you implement sounds in a game. I just love good sound and I am a musician myself. So how hard is it to make The Witness a really good VR experience assuming that hardware isn´t the problem for the consumer? To be save I dont want to suggest more work. I get that there is still a ton to do until release. But I´m just curious. And who knows maybe The Witness would really fit VR and sell really well. I vote for a VR edition of The Witness but, please, AFTER the regular game is released. Well of course. VR isn´t really out yet. I also guess that the Ipad version will have a higher priority after the initial launch. While VR isn’t out yet (realistically it is, but ‘the big three’ at least), the Vive will be out, albeit in limited numbers, when The Witness arrives. Given the nature and apparent length of the game, revisiting it in VR seems kind of unlikely for the vast majority of players. If the Vive support is there day one, and someone is lucky enough to have a headset, I can imagine it’ll be a great experience, but it seems like something that’s going to benefit very few people if it’s essentially retrospective due to late implementation or hardware availability. I would really like to see a blog update on the status of the VR development though. How locomotion is being handled, if both major PC headsets will be supported. If Valve’s wands will work, etc. With a game so focused on observation, what better way to examine the world than within VR? Despite the prolonged development, it’s kind of a shame it’s not another couple of months out and it could have been on all three for launch. Most people are not going to want to hold off on the first experience to be with VR, even if it would be to their benefit, I imagine. I *really* appreciate this post, a lot of details I didn’t really know the dynamics of before now. At this stage– having written, tested, and performed each speaking role yourself, how much room for variance do you expect the VAs to have (be it in tone, delivery, manner of speaking, etc.)? I’ve always been rather curious just how much of the performance is defined by a voice actor, I guess. Well, I have never really been trying to give real performances in the temp voice. In the beginning I did a little bit, just to see how much work it would take if I were to read those parts in the shipping game, but even that was really more about recording under different ambiences and noise levels as an experiment to see how it would feel in the game. Once it became clear we would be able to hire actors who would deliver good performances, my readings became much more perfunctory, and really just about getting the bits into the game at all. So as a result — we won’t be using these as a guide for the actual acting. In fact I doubt the actors will ever hear those temp voice pieces. They are more for my own sake! Particularly neat to see the running water, as I don’t think we’ve gotten a good look at that yet. It must be exciting, but perhaps daunting, to have to finalize and commit to many things that have remained open items for so long. To be fair it’s perfectly natural to want to hype something one’s put much work in. It’s hyping something without the effort and polish that’s disingenuous. Oh BTW music doesn’t always jeopardize players’ immersive feelings to one game. I mean look at Lostwinds by Frontier, its properly composed music enriches the depth of the scene and actually makes the game more immersive. Have you ever looked at trees from a comparable height in actual life, when not in gale-force winds? They don’t, you know, move that much. Yes, but I’m talking about *completely* still here like model trees (well, I mean real-life models), even though the environmental sound gives you the feeling that some strong winds are blowing, that’s against the life experience (especially for beach trees with broad leaves, or tall trees with thin branches and sharp tip, etc.). Agree about the trees, the leaves not moving feels weird , and it is indeed noticeable from above. (Although this may be too complicated of a technical problem to implement as late in the development cycle, and it’s excusable). The leaves move, it’s just slow and subtle…. you know, like real life. Watch the release date trailer again and if you look carefully at 0:18 (puzzle with the magenta-colored background) you can see on the right-hand side of the panel the shadow of the leaves slowly swaying. Everyone is making such a big deal about trees not moving… Honestly, when you look at a simple aspect as such, look at it’s entirety first, then make the approach of a suggestion (and be bold about it! ); a to realistic gamer is a sad gamer. Besides, the trees are done fine, and they do move! And also, I don’t want to be annoying, but are the stiff animations on inanimate objects intentional? I could swear I heard sounds of life. But I guess that is just my brain adding things it assumes are there? Weird. I don’t know much about game audio, but the video sounded a bit strange with headphones to me (complete stereo separation of some things). Obviously for a video you can’t have different sound options without including discreet tracks in the file, but is there going to be a headphone option in the actual game? I’m stunned by the care you put into every single aspect of this game! Things like translations are so often botched because no one really cares about it. A question – I’m going to have to get some new hardware to play the game – is there any reason to prefer PC or PS4? It just depends on which platform you like. It is the same game on PC and PS4 (though we have lower-quality modes for lower-end PCs, but the PS4 always runs at high quality). Is it me or there’s something slightly wrong with the water reflection in this screenshot? Thanks for the update! Jan is almost here! Do you need someone for the french subtitles? and contributed to the french translation of Portal Stories: Mel (Portal2 mod). but, I still offer you my help, it would be an honor to translate your game! But I can sacrifice myself for the french gamers. If needed, I can offer my help for the french translation. I was about to beg you guys to do Latin American for Spanish and not Spain, but I see you have both. What a relief. Nothing again Spain but their translations for both movies and books are never international or “neutral” as we call them. May I ask who is doing the Latin American translation and what country it’s from? The translation for Braid was great for the most part because it used neutral/international Spanish, but at times intricate meaning gets lost in translation. Sometimes they didn’t set accurate words to create sentences properly. Thanks to this I was able to share Braid with my 60 year old father, who absolutely loved the game. So this is very important to me. When Spain is in charge of translation they translate only for Spain and no body else. When a Latin America country like Mexico or Venezuela is in charge, they translate for the whole continent, and we have always been very aware of this! I’m so excited for this game that I’m just posting on this site again. I am going to buy the game on launch for PS4, and then I will buy a 2nd physical copy for fun and to show my love and appreciation to the developers! Hey Jonathan, I’ll be willing to make a Turkish subtitle for your game if you are interested. I am translating subtitles for movies as a hobby and I am pretty good at it. It’s great to get an insight into how a game like this is made. Even better when it’s able to reveal some of the third parties that help out like Wabi Sabi. Interesting to see Indonesian on that list! Was there a lot of interest from Indonesia for Braid? Indonesian should make it nicely readable for people in Malaysia to, as the language are quite similar (bahasa mealy and bahasa indonesia). Indonesia is jumping over owning a personal computer for the most part and going straight to smart phone / tablet. I just did Indonesian because it is a pretty big place that not a lot of game people localize to usually. It was more of a “why not?” kind of a thing. I don’t know if this means anyone extra there will buy the game! quite distinct, but not a leaf was stirring at ground level. Just a thought. think anyone has done it convincingly. aesthetic in terms of both the gameplay and the setting. Seeing that river, which is gorgeous by the way, made me wonder about traversal. How free is character movement? Can we swim if we choose? Are there invisible walls, and how do you deal with fall damage? I’ve been following this blog for quite a while and I’m really looking forward to getting my hands on it. It’d be great to get a new wallpaper of the island. I have a feeling mine is out of date. As for jumping and fall damage, there is no jumping or falling in the game, I believe. Usually the idea is that all places you can go are accessible traveling both ways. Great news that you are working with Wabi Sabi Sound. Thanks for the screenshot video. For those asking about the trees, I asked myself the same question a long time ago but in the gameplay video you can clearly see thet the vegetation is moving when you are close. It’s a slow movement just what you need in a “quiet” game about perception. Hello guys, can’t wait to play this game with my girlfriend, we can’t get enough of this kind of game !!! I just had one question, will The Witness be compatible with VR sets ? It would be such an awesome feature with those graphics ! If puzzles depend on noticing sounds around you, are there ways for players who cannot hear or do not have sound turned on to solve these puzzles through captioning of some sort? Looks great! Can’t wait for January! 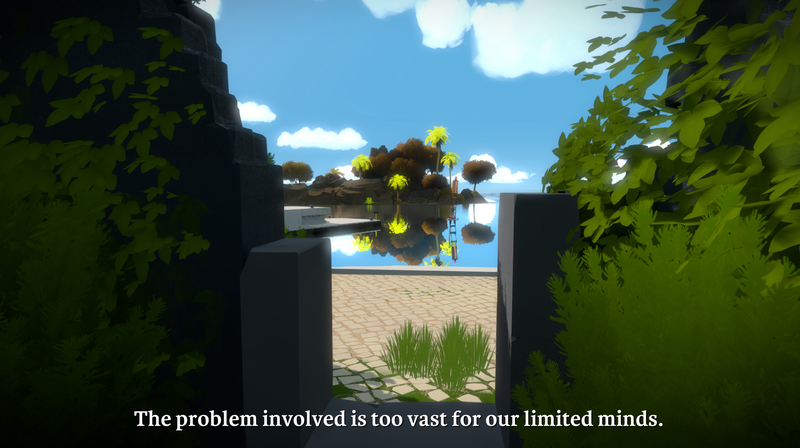 I wonder what you all think – will the Witness follow a similar narrative path? I’m sure interpretations aren’t strictly limited to my three categories – but it helps me to look at it this way. Point is – I’d be surprised if the Witness doesn’t have a somewhat similar structure. There’s an ‘easy’ meaning for the people that just want to play it and be done with it and then several other more ‘difficult’ meanings that come from solving more puzzles and also investing more time into understanding the story elements (text, statues, etc.). Nate, Braid like any well crafted thing has multiple layers and every layer could have a different and sometimes even contradictory interpretation. The definite meaning John was probably referring to was the search for destructive knowledge which is the main focus of Braid communicated through gameplay. The Witness similarly will be layered and have multiple things inside it to contribute to different subjects and interpretations that try to communicate different things. The most important things will probably be gameplay again and this is the whole game split into two parts (Braid had it’s main part as a platformer and exploration/object collection through puzzles) 1)screen line-maze-puzzles and part 2) observation. In Braid great moments of epiphany happened by witnessing strange and different behaviors in time. I The Witness great moments of epiphany and discovery (the main focus of the game) will happen by seeing; a reflection on the water, a flash of light in a cloud, a bubble in a stream, a collision between a shadow and the light. Hello guys, a have a question about puzzles that you complete in the game. If you want to can you activate a completed puzzle panel to try it again? I ask because you learn a lot from what doesn’t work as well as what does. If hypothetically for example the first thing you try in a puzzle is correct then you haven’t learned as much as you might have hoped. By trying other variations (some of which might work) you’ll learn a lot more about the rules of the puzzle. Judging from gameplay demos, you are able to retry puzzles, even if you’ve already completed them. 10 bucks says there’s at least one puzzle that has Obvious solution 1 and an obfuscated, tricky solution 2. And you know what? I’ll be stumped for hours, find the obfuscated, tricky solution and feel amazing, then find the same puzzle on youtube with the obvious solution and feel like a dummy. I know that your languages list is long enough, but still I am curious, was a Czech support was in candidates list ? I get that most probably you will remove some language from the list rather then adding another. Also I see that some guys offered help with their native language and I totally understand reasons why you won’t/can’t accept it. Very beautiful screenshot/video. I can cleary see there is a tonne of unseen and hidden details there and you folks have clearly been cluttering up the world. It looks jam packed with details. Also I always thought it would be kind of cool if Jon did the final VO in the game. I honestly figured that’s what was coming anyhow. But, you guys will feel out what is best! I’ve been attempting to forget about the Witness until late January. It will be nice to get a Game of the Year in January for a change. What that says for the rest of the year, I don’t know. Comments like this are my pet peeve actually. We are drowning today in crappy computer systems that do not value the user’s attention or peace of mind, and we are expected to then spend the extra time and attention to figure out how to change all this stuff to reasonable settings — and then do it again, and again, every time an OS “upgrade” changes the settings back. Multiplied by the number of different computers I use every day, the whole situation is absurd and horrible. When you say “was that so hard?” I just get instantly angry. Not to mention the fact that it was just rude to begin with. Life: Be a civil human being- Don’t be a know it all- Share your information freely without snark-profit. Any word yet on the game’s price? I’d like to add a voice in favor of Hebrew. I’m very disappointed at how few games support Hebrew at all.